Get on top of the world in this tough but doable hike up to the top of Mt Maroon. The track is 6 km return journey but is mostly steep and where it is not steep it is close to vertical. We managed it in 6 hours, though fitter and faster hikers can do it in much less. The 360 degree views at the top make the effort worthwhile. Note: This is a difficult and often dangerous hike. Most of the track is steep, rocky and poorly defined. Part of the track goes up a gorge that is close to vertical with lots of loose rocks to trip you up or fall or your head. When attempting this hike: go in a group or tell someone that you are going. Take your mobile phone (as you are on a mountain you get reception on much of the hike). Wear appropriate clothes, especially boots with ankle support, and tough wearing pants as you will often have to slide down the rocks on your bottom. Most Importantly: do not attempt this hike if it is raining. 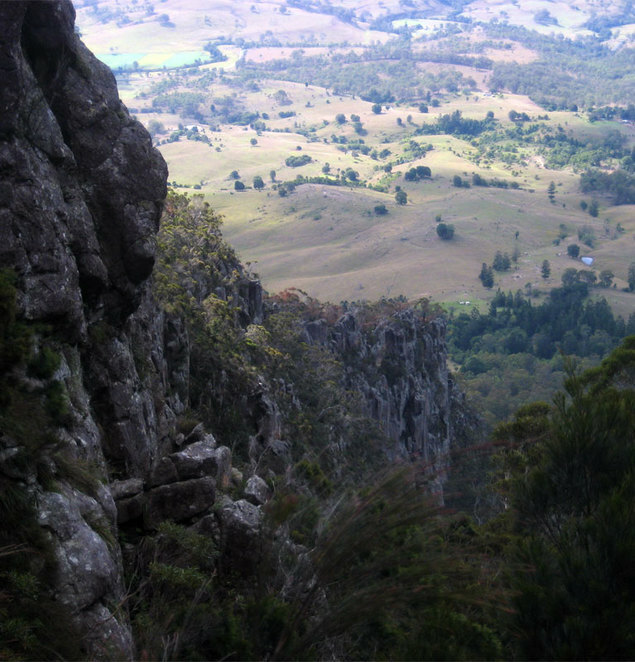 Even mild rain can make the rocks at the top very slippery and the gorge can especially dangerous. Okay, so if I haven't scared anyone off, it is an amazing hike that an even moderately fit person could do if they take it slowly. After all I was able to complete this hike with my dodgy knee, slight sense of vertigo and poor fitness for climbing. The views really make it worth the effort. The mountain itself is spectacular and the views from to surrounding peaks is amazing. We were especially blessed with a layer of fog below us in the morning so we could see surrounding mountains peaking out from the clouds as we climbed. 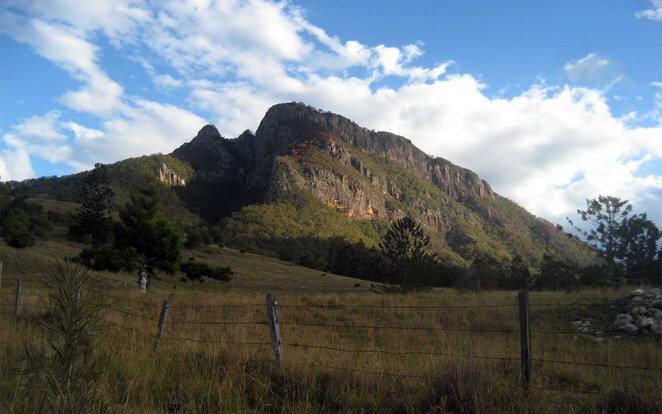 The hike starts at the end of Cotswold Road off the Boonah-Rathdowney Road. While the path is not well marked it is hard to get lost as their is only a single path and your only choices are stay on the path of head off the side of the mountain. 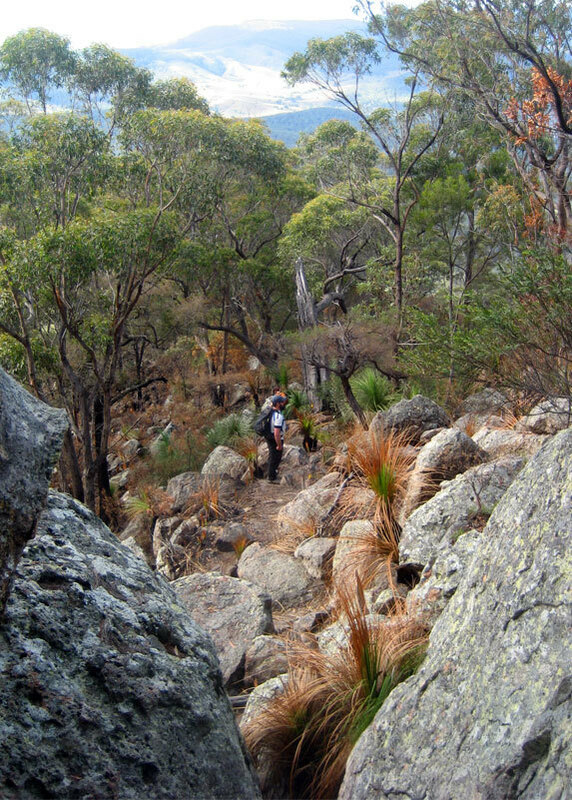 The first part of the hike is steep, rocky, with some scrambling required and leads to a lovely rocky outcrop that provides great views and a nice place to rest before attempting the hard part of the hike. If you find this first part hard going these views are in themselves worth seeing. 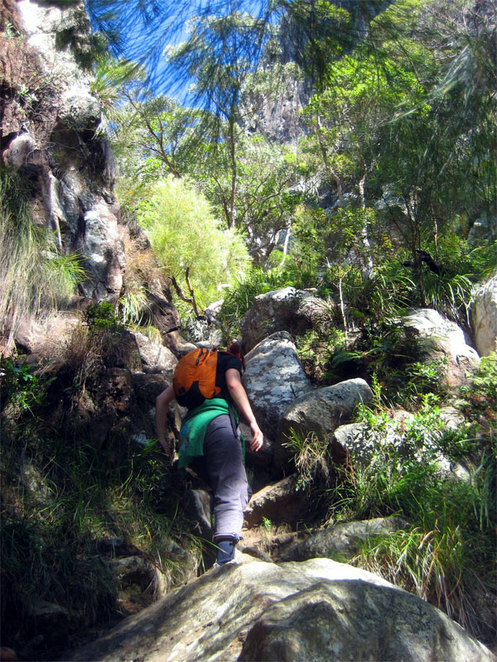 From there the hike leads up to a gorge where you go from scrambling to actual climbing. None of is particularly technical, however shorter members of your group may need assistance up some sections. The top of gorge levels out and the path is less clearly defined at this point; especially when you start scrambling up bare rock. However if anything seems too hard then you are probably off the path. Look for the yellow arrows and yellow painted dots to get back on the path. 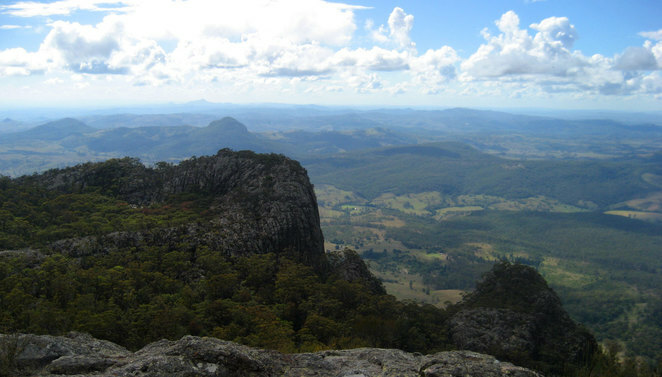 Then you arrive at the top where you have an amazing view of the surrounding area including the twin peaks of Mount Barney and the wedding cake shaped Mt Lindesay. While it is mostly bare rock there are a few stumpy trees to rest under if you went up on a hot day. 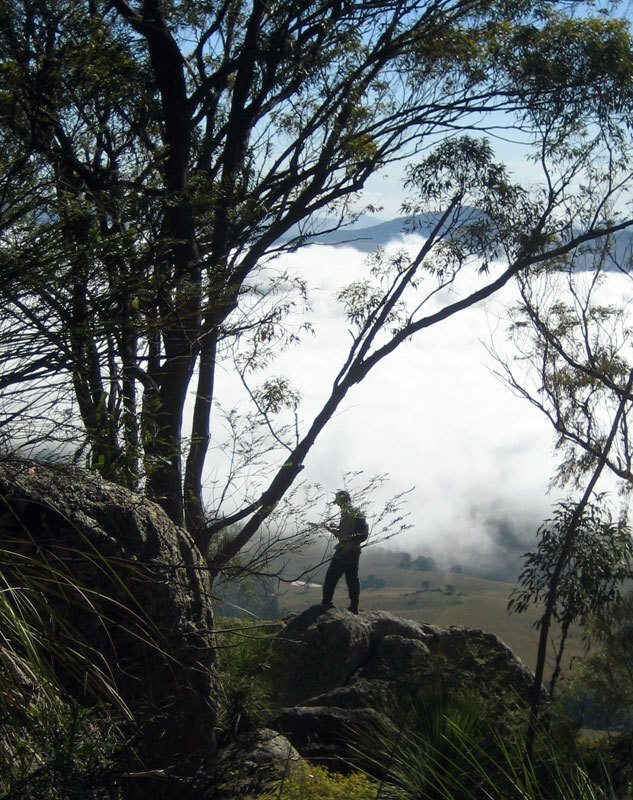 If you have the fitness it is truly worth the effort to make your way to the top of Mt Maroon. Afterwards you can stop in at the Rathdowney Hotel for a well earned beer or perhaps a hamburger from the Rathdowney Store.